We service all types of sloped roofs in Central Virginia’s 13 counties which surround the central city of Richmond: Ameila, Caroline, Charles City, Chesterfield, Dinwiddie, Goochland, Hanover, Henrico, King William, New Kent, Powhatan, Prince George, and Sussex. Pitched Roofs are designed to shed water faster than a low sloped roof, they are usually less expensive to install and have a longer lifespan. This is because shingle systems are easier to install than the complex task of putting a water proof membrane on a relativity flat roof with lots of penetrations like skylights and vents. This of course depends upon the type of roofing material you choose for a pitched roof- affordable asphalt shingle versus slate tile. ​Asphalt Shingles: Sometimes called composition shingles, about 80% of all pitched roofs in the USA are covered with these. There are two kinds of asphalt shingles, organic or fiberglass. Organic asphalt shingles have a cellulose fiber base made of recycled paper and wood fibers then coated with asphalt and a mineral coating placed on the front side to resist weathering. Fiberglass use a base of fiberglass to give the shingle more strength and flexibility then the base is treated with asphalt and a mineral coating applied just like the Organic composition. Life expectancy 20 to 30 with the fiberglass composition on the higher end. Asphalt Shingles require no maintenance besides storm damage repair. Dimensional Shingles: These shingles are a thicker version of asphalt’s organic and fiberglass types. The additional layers are sculpted to show shadow lines giving the roof more of an artistic look. Plus, the extra thickness increases their life expectancy to 40 years. Wood shingles & Shakes: These shingles are made from cedar, redwood, or less often pine. 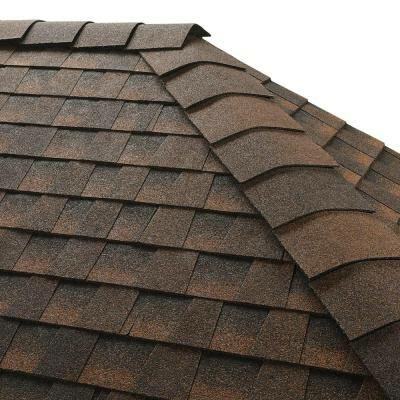 The difference between the shingles and shakes is that shakes are handmade or sawn on one side only to look rougher, whereas shingles are sawed by machine. These provide a classy natural look to a roof besides imparting a woodsy aroma about the home for a time. However, the life expectancy of wood shakes and shingles 8 to 25 years is much shorter than other roofing options. Plus, they are a very expensive option compared to asphalt shingles. Shingles cut from knot-free heartwood western red cedar comprise the higher life expectancy of wood shingles and shakes because of its natural resistance to decay which also makes them more expensive. Some communities require that wood shingles and shakes be pressure treated with a fire retardant prior to installation because of increased fire hazard. The tiles are available in Concrete or Clay with clay being more expensive. They come in many colors, and their shapes include the half-barrel, S-shape, interlocking, and flat. They have a life expectancy of 50 to 100 years, but since they are very heavy the roof must be constructed to support additional weight. Additionally, most clay or concrete tile manufactures do not recommend walking on them due to a high probability of damage. The tiles sometimes are pre-fitted to 2 by 6-foot boards which are then nailed to solid plywood roof sheathing or the decking. They are similar in expense to wood roofing but life expectancy is much longer and its fire resistance is exceptional. The Concrete tile over time develops a chalky deposit on its surface called efflorescence. Efflorescence dulls the sheen of the tiles surface, but does not affect the structural integrity. Manufacturers suggest buffing tiles with a clean rag to restore shine (we really cannot see people doing this) or after installation the roof could be coated with a clear primer. 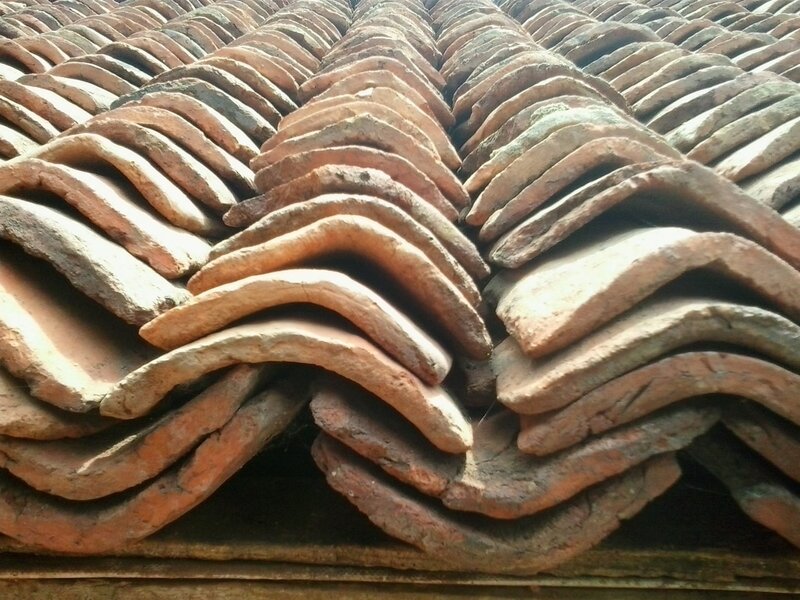 Clay tiles have a great natural look and are a readily renewable source. They are manufactured from clay and water then fired at high temperatures. As a rule, they have minimal water absorption and high resistance to high heat cracking. However, they do not withstand freeze and thaw cycles well unless you opt for the reinforced kind which is vastly more expensive. They do have a very long lifespan about 100 years making them one of the most durable roofing materials available. Metal Roofing is costlier than the least expensive asphalt roofing, but has a longer lifespan and better fire and wind resistance. This lightweight option is made of steel, zinc alloy, copper or aluminum. Copper roofs are installed unfinished and eventually develop a green patina over time. Steel roofing commonly comes with a painted finish or a zinc coating. You can have your metal roof installed with exposed or hidden fasteners. 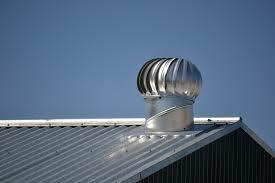 Metal roofing is purchased in sheets or shingles that mimic other materials. Depending on the material, the durability ranges from fair to extremely durable and the cost can be moderate to expensive. 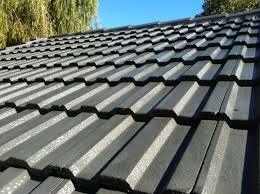 Metal Shingle: Aluminum, steel, copper and zinc are the most common types of metal shingles. Also, they have an expensive wide price range with copper and zinc being on the high end. These are a much more expensive option then asphalt, and require specialized skills and equipment to install. Life expectancy is 40 to 70 years depending on type. Obviously, many people aren’t going to own the same home for 70 years but they are exceptionally beautiful roofs which is enough reason for some people to install them. Slate: The diamond in the rough of roofing systems, and perhaps the most expensive option available- close to 5 times the amount of traditional methods. Slate has a very beautiful unpolished stone look with a wide range of colors, such as gray, green, purple, black, red, and mottled tiles that have several colors mixed in. Slate roofs can easily last 175 years or more. However, slate roofs require an expert to install for several reasons: Because slates can’t be walked on, roof scaffolding must be used. Slates that are walked on may break apart immediately or 5 to 10 years later- giving rise to a roof that does not shed water. Those who want a slate roof should get proof of the roofer’s expertise with slate as well as learn a little about the process themselves so they can oversee the project. Also, the roof must be structured to handle the heavy weight (800 to 1,500 lbs. per 100 sq. feet) or roof collapse at some point will befall the inhabitants. Some Slate Roofs are over a hundred years old- skilled installation is the key to a long lifespan. Typically composite cedar shakes and slate tiles are made from rubber recycled materials and a mineral filler such as ground up limestone then mixed with proprietary plastic resins and colors. They look the same as cedar shakes or Slate tiles but have a much longer lifespan- maintenance free with a 50-year warranty. They cost about 4 times the amount of Asphalt shingles which really puts them out of some peoples’ price range. ​Central Virginia Roofing offers Free No Commitments roofing consultations with estimates for roofing repair, roofing replacement or a new roof system. We have only experienced, licensed and insured employees working on your roof. We only use high quality time tested roofing materials.